A few weeks ago, I went to the Garagiste Festival in beautiful Paso Robles (http://californiagaragistes.com/). All of the participating wineries were small producers, so there were quite a few I hadn’t tried or heard of. 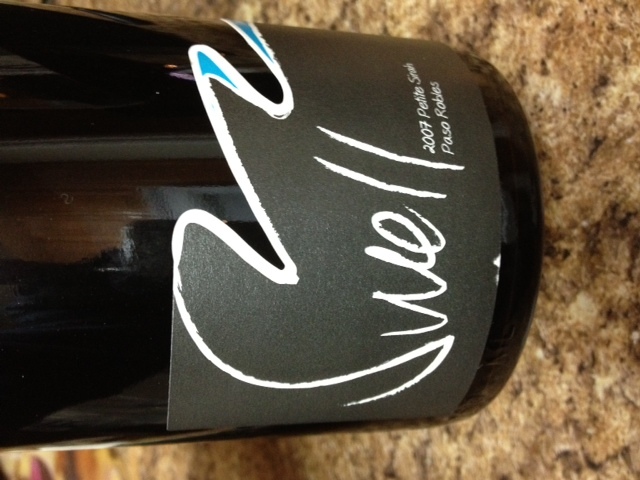 One was Aaron Wines, and I decided to pick up a bottle of their “Swell” Petite Sirah. Petite Sirah is full bodied, dark and bold in character, so I knew this would be a food wine. The Swell smells like blackberries, black pepper and paprika. This is dry and I can feel the grip of the tannins on the mouthfeel right away. The fruit is bright, and then the tannin quickly evens out the juiciness. Finish is spicy and bone dry. This is not a California fruit bomb that is easy to chug, this is a powerful petite sirah that is much better with food. I wouldn’t have it with any meal with too much heat because this wine is so dry that you’ll end up drinking a whole pitcher of water just to counteract it… but something a bit spicy and fruity at the same time would be awesome. And I just need to smell this again. This wine just smells HUGE and I’m liking that every time I smell it again, different spices come out.